Click here to locate your child's bus stop and pick up/drop off times. Adhere to the posted speed limit in designated school zones. When approaching an intersection where a crossing guard is present in the crosswalk with the stop sign raised, do not cross – or turn – into the crosswalk until the guard has completely left the crosswalk. Never stop a vehicle in a manner that blocks a crosswalk. When you approach a stopped school bus (from behind) with lights flashing and the stop arm extended, you must stop. you are on a divided highway and the roadways are separated by a physical barrier. 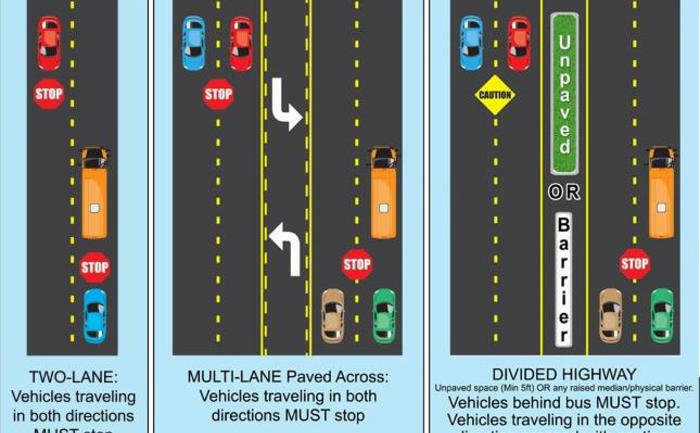 You are required to stop at least 10 feet away from the school bus. You must not resume driving until the school bus turns its lights off and withdraws its stop sign. Be certain all exiting children have reached a safe place before proceeding.